We Have the Special Hats and Ensemble Accessories You Want! DDA Hats & Fashions of Los Angeles, California, has the hat or purse you want and the accessories to match. Get designer suits, sunglasses, purses, and jewelry when you shop in person or online. These brands are in demand. Sale priced hats range from $9.99 to $59.99, and regular hats are $79 to $289. Whether you are going to Church, the Kentucky Derby, a wedding, or out to dinner, we have your hat. Our most popular ladies hats are heavily embellished with beads and rhinestones. New hats are added bimonthly. 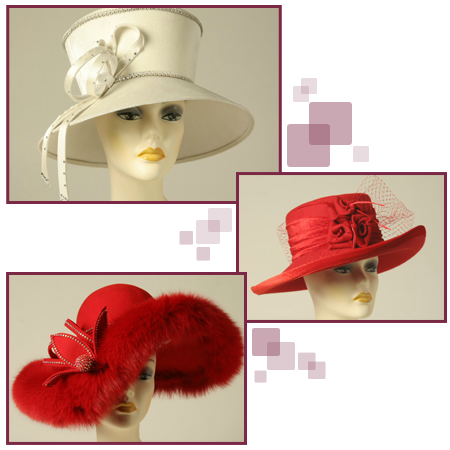 Deck yourself out in fashionable furs from DDA Hats & Fashions. We offer a variety of deluxe brands that are in demand. Prices start at $289. Choose from luxurious fox and mink in pink, blue, and natural colors. Fox is our most popular fur, and new items are added in the fall and winter seasons. Revel in our affordable jewelry with top brands by Heidi Daus and St. John. We offer everything from statement necklaces to pearls and earrings. We have all the colors and styles to enhance your personality. Items are affordably priced, and new stock is added weekly. Make a fashion statement in Gucci and other high-end designer sunglasses. We offer the perfect accent piece that will also protect your eyes from the sun's searing rays. Prices start at $99. We carry cat eyes and heavily embellished glasses as well as round, square, and other styles. Our most popular glasses come from the Miu Miu collection. New items are added monthly. As the saying goes, these purses are to die for. We carry products by Mary Frances, St. John, Mylinka, and Color K. Our prices start at $59.99. Mary Frances is our most popular line, and new purses are added monthly. All these brands are constantly in demand. Prices range from $99 and up. Designer knit suits come in sizes 2 through 32.